This is to discuss anything related to the forum such as bugs, suggestions, etc. Discussion for Mega Drive pirates and companies. 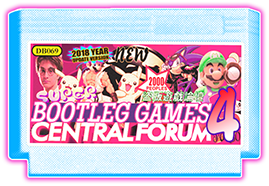 Discussion for Super Famicom pirates and companies. Discussion for other pirates belong here. This is for the discussion for BootlegGames Wiki. This wiki contains info on many pirate originals, companies, hacks, etc. This is for hacking any pirated games whether you discovered something through hacking a game, making cheat codes or ROM hacks. The section of the forum where you can buy, sell or trade pirates. This is for other things that wouldn't fit in really such as hacking, selling, etc. Anyone with an interest in games that are licensed/indie can come and talk here really. Pretty much any other discussion goes here that doesn't go in the other forums.